Every Diocese in the Episcopal Church has been influenced by the context and cultures in which it finds itself, and the Diocese of South Dakota is no different. One of the elements that has contributed most substantially to the richness and depth of unique spirituality in the Diocese of South Dakota is the cultural and spiritual traditions of the Dakota and Lakota people. Here you will find resources that represent and help to further this important element of the Episcopal tradition in South Dakota. Certificates of Baptism and Confirmation meant nothing to Indian converts who could not read. Bishop Hare desired to give to those who took upon themselves obligations as Christians some token that would not only mark them as communicants, but also serve as a constant reminder to them of their Christian calling. He therefore in 1874 designed a cross to serve this purpose. The oval in the center is his episcopal seal. Around its margin in Latin is inscribed “The Seal of William Hobart Hare, by the grace of God Bishop of Niobrara.” The Greek letters on the cross, which quarters the oval read, “That they may have life.” In each angle of the cross is a tipi surmounted by a small cross. The seal signifies that Christ has come to the Dakotas and gathered them under the protection of the cross, that they have accepted him, and their homes have become Christian homes. For the policy on obtaining a replacement cross, click here. It was always the purpose of the Book of Common Prayer to allow people to worship in a language that they could understand. 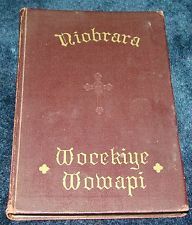 For that reason, the American Book of Common Prayer has been translated at different times into over 20 languages, including the Dakota dialect of the D/Lakota language. 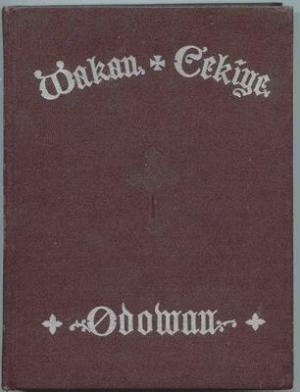 The Wocekiye Wowapi, or Book of Common Prayer in Dakota, is a translation of the 1928 American Book of Common Prayer, and it is available in electronic form for free here. The Dakota Prayer book has also recently been republished and is available for purchase in printed form. Hymns from the Dakota Hymnal, sung in Dakota, were recorded at the 130th Niobrara Convention and can be purchased on CD. While it may be difficult to find copies of the Bible in Dakota still in print, it is part of Cornell University's digital library and can be read here. One of the most important ways that L/Dakota culture and tradition have influenced and will continue to influence the spirituality of the Episcopal Church in South Dakota is through language. General Language Information: Information in general on the language spoken by the L/Dakota people, as well as well as its dialectical differences, can be found here. Writing and Pronunciation: There are a number of different orthographies, or writing systems, for this language, and these can be seen in the article linked above. The resources in use by the Episcopal Church in South Dakota use their own unique writing system, although it is similar to several of those used elsewhere. An explanation of how to pronounce this writing system can be found by clicking on the below images. Ate unyanpi, mahpiya ekta nanke cin, Nicaje wakandapi nunwe. Mahpiya ekta nitawacin econpi kin, He iyecen maka akan econpi nunwe. Anpetu iyohi aguyapi kin, anpetu kin de unqu miye. Qa tona ecinsniyan ecaunkiconpi wicunkicicajujupi kin, He iyecen waunhtanipi kin unkicicajuju miye. Qa taku wawiyutanye cin ekta unkayapi sni miye; Tka taku sice cin etanhan eunkdaku miye: Wokiconze kin, qa wowasake kin, qa wowintan kin, hena ohinni qa oninni nitawa heon. Amen. He wowitan yuha nunwe. Amen. We turn to our Grandfather in the West, To your symbol color of black. To your symbol of thunder mighty and purposeful. To your lessons calling us to balance our emotions in the spirit of gentleness and honesty. To invoke your spirit of introspection, seeing within. Give us your strength and the courage to endure. We turn to our Grandfather in the North, To your symbol color of white. To your animal symbol of the buffalo strong and nurturing. To your lessons calling us to balance our spirit in harmony with our brothers and sisters. We turn to our Grandfather in the East, To your symbol color of red. To your animal symbol of the spotted eagle who carries sacred messages. To your lessons of wisdom and knowledge revealed to us. Help us to love you with our whole heart, mind, and soul. We turn to our Grandfather in the South, To your symbol color yellow. To your animal symbol of the crane which brings us in touch with earthiness and growing things. To your lessons calling us to balance our body in the spirit of a good sense of humor. To invoke your spirit of innocence, trust, and love. Help us to open our eyes to the sacredness of every living thing. We turn to our Grandfather in the Heavens, To your symbol color of blue. To your animal symbol of the bald eagle, who soars ever upward and calls us to a high spiritual life as well. To your lessons of relying on your protection and calling on your help. To invoke your spirit of trust and hope. Help us to turn our hearts ever toward you in daily life. We turn to Grandmother Earth, To your symbol color of green. To your animal symbol of the mole, who travels through you and is never separated from you. To your lessons of nurturance and harmony with all living things. To invoke your spirit of nourishment and balance. Help us walk a good road every day of our life. We look to God who cleanses our earth and us with snow, wind, and rain. To Jesus who fills us with the wideness of mercy and lovingly embraces us all. And to the Holy Spirit who inspires us.